whenever i wear hair combs, the first one always goes in very well and looks great the 2nd is an absurd s.o.b. 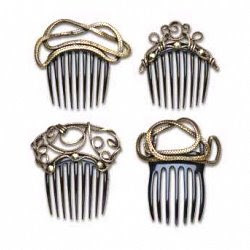 of a hair ornament. i now see the brilliance of those ladies in the 1980s who wore one in just one side and made it a trend. "hm... when did i last shower?" "sunday. no, no... wait... saturday night. no. saturday. morning. 8am. uuuuuggghhhh...."
this is the wild aran set i knit for Collin for christmas. see, i told you the little cutie was making me a crazy knitting lady. still, this set is really hard to resist. knit in Bollcine Dolly (5 skeins #602 kale green and 5 skeins #603 olive green, 100% superwash merino wool) purchased at K+S=B on size US 3 and 5 needles. this was such a cute little gift, but by did it take a lot of knitting. lets review all the pieces so one can fully appreciate how much knitting was done. i made: a pair of mittens, scarf, hat, sweater, and pants. yes, i have knit cabled pants. i have already admitted that i crossed over into a new area of knitting lunacy. what more do you want from me? i will say that the pants are what really took it out of me. thy were a ton of knitting for their size, and you had to pay plenty of attention to it because while the stitches were not hard, getting the increases and cable turns worked out was tricky if distracted. i joined the pants to knit in the round once i finished the leg increases and crotch shaping. the top was worked this way with a purl stitch to mark the seam at front and back. 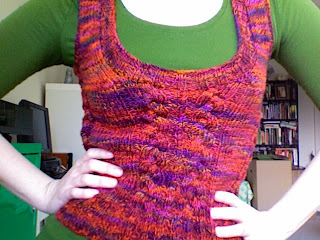 i also knit the sweater in the round up to the armholes and then divided to make the fronts and back. additionally, i knit the backside of the sweater only in double moss stitch rather than in the cable pattern as it was written. i did this for a few reasons... 1. it was faster. 2. babies spend a lot of time laying on their backs hiding their sweaters in car seats and swingy chairs. 3. if i spent a lot of my time reclining, i certainly would not want a lumpy cable pressing into my back. were i to knit this again (and let's face it, i probably won't) i would make a few other changes to the pieces i knit early on in the process. mittens and hat would have both been knit in the round instead of seamed. i would probably have grafted the top of the hat closed as well, although i think the seam gives it some stability to make the tassels pop out at the sides. overall, i am really happy with this one. obviously i started it before i got word that Collin was a boy, so i picked green, and i am hoping my cousin will out it on her other kiddos as they come along. who wouldn't love to see the sweater worn with pink or purple corduroy pants by a girl? or how abut those pants with a hot pink hoodie? my cousin is not a very girlie girl, but her sister-in-law is, so i think my visions of this ensemble being pinked out will eventually come true if a girl comes along. and now, the gratuitous picture fest... i have not figured out at this point if blogger will let you do a cut in a post, so bear with me. no one uses dial-up now anyway. i know, these are silly. i did a boatload of knitting for my family and rW in 2008, so i am being selfish for a little bit and knitting for myself. see, that's the thing... i have all this stash for stuff for me. i have to buy new when i knit for others. time to bust some stash and get some stuff knit up for me to boot! knit in Mountain Colors River Twist (2 skeins "Firehole River", 100% merino wool) purchased at A Yarn Shop in Marblehead, OH on size US 4 and 6 circular needles. let me say up front that this is a good pattern if you have some knitting experience and can use logic to fill in the blanks. the designer is from Finland and her english is good by not her first language. it is no harder to decipher than an over edited pattern in a knitting magazine. it is very hard to take pictures of yourself. i used to be better at it, or at least i used to be happier with my self-photography. this was really fast and fun, and it is cozy to wear, but were i to knit this again (and i may) i think i would make it longer and bring the neckline up higher for a more functional vest... probably in a more subdued color. this one is just a lot of fun and acts as much as an accessory as a practical garment. this yarn is beautiful, and i like it so much in the ball that i plan to keep my last 20ish yards as a treat to pet and look at from time to time. knit in Reynolds Rapture (1 skein charcoal grey 50% wool, 50% silk) purchased at K+S=B on size US 10 needles. i knit this from a skien of yarn left from my first sweater. i liked it then and i like it now. 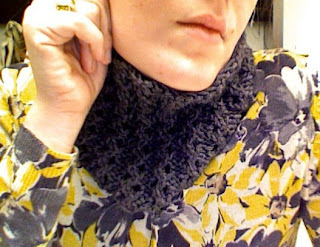 the ribbed lace is surprisingly warm, and now my neck warming garments have chalked up another among their numbers. i have three favourite scarves, and i think i am wearing them out with my devotion. i have another vest and a scarf on the needles right now. the vest is a fun knit, and the scarf is another fast one for rW. not that he needs a new scarf this week. he is in tampa for a conference. living in the DC area can be tiresome. here the national news is the local news, and we hear about every little political detail of both parties in all branches. most of the time, i like being overly informed, but i have one complaint. can't we bring back "Director"? how about "Supervisor"? "Tsar" seems so mustache-twirling, metal-helmet-wearing, spear-carrying... oh, and 19th century. not that kind. the real kind. this is homemade blackberry jam made by my FBIL who picked the berries with his BFF. i put it on my oatmeal yesterday for breakfast, and it was amazing! this was the extra special part of my christmas present from my cousin and her culinary-gifted husband*. i wish i had a picture of the whole gift basket of homemade treats, but the basket had to stay in ohio. i squirreled away the treats in my checked baggage individually, and it has been well worth it! in addition to the jam, there was a box of chocolate chip cookies, chocolate dipped pretzels, bags of homemade pasta, a jar of sauce, and one of my favourite parts--homemade cheese crackers!! they were amazing. i could have eaten the whole box in one sitting. now you can make your own cheese crackers and eat them in one sitting too. go see the recipe on FBIL's blog here. i am actually scared to make these because i have visions of none of my handknits fitting after i eat a whole pan of crackers. AND this comes form the gal who hates Nips or Goldfish crackers. that says something for his little cheesy delights. *it is worth noting once again that the culinary-gifted man my cousin married cans his own blackberry jam. in case you didn't notice the canning part. you know, the thing that prohibits the rest of us lazy you-know-whats from making jam. i am not an actor, but if we still had radio plays, i may well could be! i am a master actor when it comes to dealing with people on the phone. i am not sure which i am more proud of. the credit card scoundrels were raising my rates for simply existing during the peak of Free Credit Frenzy. and with Comcast (who will claw you back into their clutches any way possible) i just lied to them. or acted. i acted like i was leaving the country for a few years. the white lie to escape unwanted services was a technique i developed a few years ago when my former roommate KT was unable to discontinue her AOL account (talk about clawing!). after three attempts by KT, one that resulted in tears, i decided to take her account details and pretend to be her. i am much meaner that KT when i need to be. aol: this is so-and-so, how can i help you today? me: i want to cancel my account. aol: i am sorry to hear that, what can i do to keep you as a customer? me: no. nothing. i am entering hospice care and my doctors have told me to settle my final affairs. aol: (long silence) well, i am sorry to hear that. may i have your account number please? KT was shocked and maybe a little appalled, but it worked. and on one level it was also sort of fun. i understand AOL reps have a job to do, but i custmers also need a little respect. regular readers may note that in my sidebar i give myself a pat on the back and list the projects i complete in the given year. it is that time of year, and the sidebar needs to be reset because soon i will have a completed project in 2009. 11 pairs of mittens or gloves. 4 items for the home. 1 pair of baby pants. and 1 lace christening shawl. 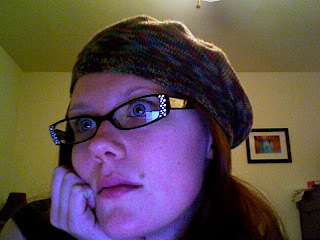 my purl beret disappeared very shortly after i made it last january. i found it! i found it! i put it away where it belonged, but it didn't stay there. when i pulled something else out of the hat box, it must have fallen behind. when i moved the entire box that lives up on a high shelf, i found it! this organizing thing is really working out well for me! meet Tangerine the Owl. he came to live with me at christmas. cute, huh? i think the whole month of december is a wash. the holidays are so time consuming and there are such a large number of other activities crammed into that time that the whole month gets swept away. with thanksgiving so close to december 1st tis year, it felt like a steamroller of holiday absurdity. let's start the new year with my favourite bloggable thing... a list. 3. i have also... practiced my hand at holiday floral arranging and being a good aunt (via hand knits). both of those items can be seen in the album as well. no pictures of Collin from me. i was too busy admiring him. i forgot to use the camera. 4. travel. i have been to ohio twice in the span of a month and to my hometown three times in a month. i hope this keeps me on Santa's "nice" at least through april or may. i get tense when i travel. going back to serious work is sort of a welcome change. 5. organized! in the midst of preparing for the holidays, i have been trying to get organized, clean out my needless stuff (who else owns 12 copies of the International Male catalogue? yes, it is for my job. ), and map out my stash so i can knit it down this year. i have a lot of yarn, and some of it is intended for really big projects, so it looks even more ridiculous. must. knit. faster. 7. happy new year! my new year's eve felt like 1945 (or something similarly quaint). rW and i walked down the street to a house party with friends who live around the corner. i baked an apple and pear pie and took it with us. (A+ pie crust this time!) i had wine and good conversation. it was a lot of fun! January 2009 is going to be busy. rW and i both open shows. i am shooting a documentary in conjunction with the show i open in february. the inauguration is going to make the city wacky, and there will be a blogiversary this month. i have a few projects i need to post about, but we are facing a slow down this month in the knitting department. hang in there with me!